Aaron's Top Fives is a new feature that I'll be doing. Basically, I'll make a list of five things based on whatever automotive-related topic I've chosen. 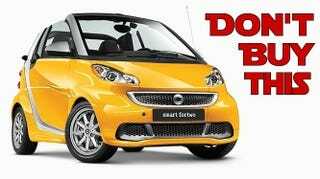 This time, it's five $18,000 cars found on AutoTrader that you should really buy instead of the Smart ForTwo, in no particular order. 2008 Audi A8L 4.2 Quattro: Make sure you get a warranty on this one, if at all possible. This one may also need a warranty. Just maybe. 2006 BMW M3 Convertible: Much better than the Smart ForTwo convertible. 2011 Volkswagen Golf GTI Autobahn: The original hot hatch. 2009 Saab 9-3 Aero: A Saab wagon; a true unicorn. Not many of these around, but man, they're cheap. Well, that concludes the first edition of Aaron's Top Fives. Stay tuned for the next report, in which I'll cover something else car-related that no one will care about. Before you flood the comments section with questions, this Aaron Paul is not the rich, famous dude from Breaking Bad and other films. This Aaron Paul is just an automotive enthusiast who happens to like writing, even though he's admittedly not great at it. Follow him on Twitter @aaronfromoppo.